This can simply be defined as the upper airway blockage. The blockage may be in the laryngeal also known as the voice box, trachea or throat. Blockage of the upper airway will result into your body lacking oxygen. By virtue that this is an emergency, it is advisable to learn Heimlich maneuver which involves knowing how to clear a foreign body from the airway. Conceivable complications that may arise from airway obstruction are, breathing failure which will on the other hand lead to brain damage and worse lead to death. What causes upper airway obstruction? Allergic reactions brought about by medications, antibiotics e.g. Penicillin, peanuts and bee stings. Other causes include: burns sustained from chemicals, bacteria or viral infections, foreign bodies, tracheomalacia, throat cancer, trauma, retropharyngeal abscess, vocal cord problems and foreign bodies for example groundnuts, coins and buttons. v The Heimlich maneuver is helpful especially if the person has a complete blockage and neither speaks or breaths. v Treatment to be given will depend on the cause of blockage for example a laryngoscope or bronchoscope is used to remove objects stuck in the airway. 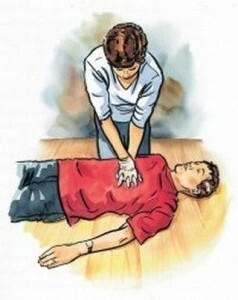 v CPR can be of much help you if a person is not breathing. When do you contact a Medical Practitioner? In a situation where airway blockage crops as a result of a disease will give an allowance to reach the hospital. However, in an event of acute airway obstruction call for medical assistance using your local emergency number. What prevention measures can you undertake? Generally, prevention will depend on the cause of the obstruction. Given below are some of the methods that will help prevent blockage. Eat bit by bit to allow chewing of food completely. Avoid taking too much alcohol on or before eating. Objects that are small should be kept away from young children. Ensure proper fitting of dentures.